This morning we farewelled our friends from Christchurch, Anna, Malcolm and their two boys Zachary and Tobi. To be honest James farewelled them as they left our house at 4am to catch a flight. We have had a fantastic four days of talking, feasting, sightseeing and just hanging out. 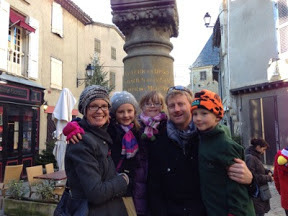 Our aim was to show them the best that the south of France has to offer and that is cheese, castles, gorgeous old villages, wine, food, friendly french folk and more cheese. I think we did justice to all of the above! The highlight for Jasper though was having two buddies to laugh with, chat to and create pranks with. 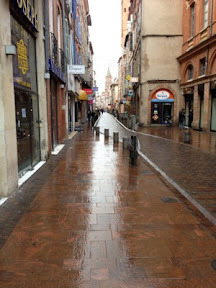 On New Year's Day we headed into toulouse city and even though most shops were closed we did manage to find an ice cream shop just in time for when the heavens opened. 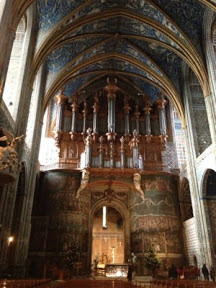 We also went into a cathedral where Hannah got to try out the acoustics. 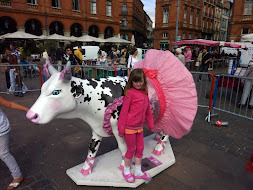 I have done a walking tour of toulouse so I got to try out all my newly learned Toulouse an knowledge - I may need to brush up on my accuracy of dates! 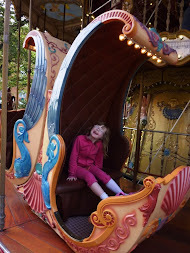 We then walked to our favourite carousel where the kids all had a ride. 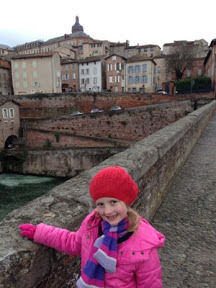 The next day we decided to do rural villages of southern France but first headed on the motorway to Albi. This was my first time on the toll motorway and after a bit of a false start - I took off before getting my ticket and Anna had to run back and get it (I ended up not needing it but better to be safe then sorry) we arrived safe and sound. 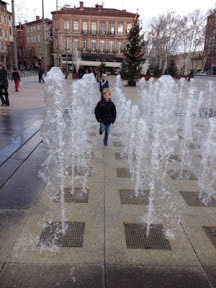 Not for long though as the boys decided it would be great to dodge the water fountains which as they got closer to the large fountain in the middle they got wetter and wetter. 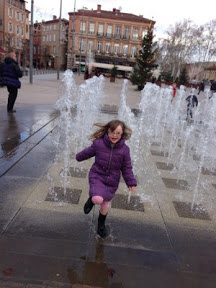 James had been concerned about Hannah getting wet but no it wasn't her! We then headed to a restaurant to warm up and had a traditional lunch which included steak hache (meat pattie), Toulousian sausage, and cassoulet. 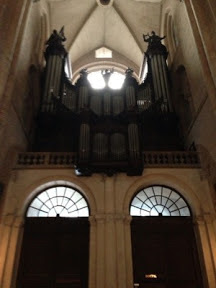 We then headed to the cathedral. It was a lovely church from the outside and Apparently the largest brick building in the world but we were not prepared for the beauty of the inside. Every available service was painted, including the floor and it was spectacular. 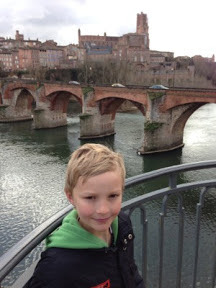 After leaving the church we went for a walk over the bridges of albi. 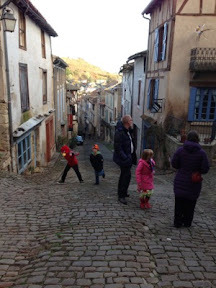 We decided to take to the country roads and go to Cordes-sur-Ciel which we thought sounded like a nice village from our map and the guide book. 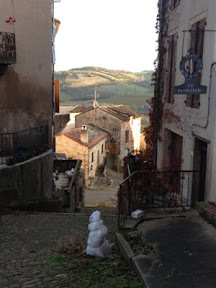 We were not expecting much more then a pretty village but we turned the corner and there was a medieval village on top of a hill - magical. After trying to find a way to drive up we ended up having to park at the bottom of the hill and walking up. It just kept going up and when we finally arrived at the top there was a lovely village and square. A great place to come back to in the summer. 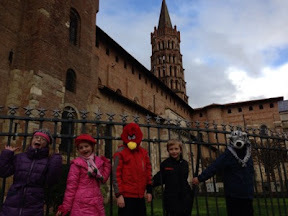 We then headed home feeling very satisfied and got ready to go out for dinner in Toulouse! James has been wanting to go to Meet the Meat after some of the other guys from Air NZ who were over recently raved about it. It did it fail to live up to its reputation with yummy French fare, and great service. The next day we had a quiet morning at home then headed to Carrassone. It was a bit more stressful journey for some reason with Hannah being quite difficult in the back seat, plus the GPS taking me on maybe the quickest but definitely the most indirect route possible - right through the city with Ferris wheels, skinny one way streets and everything. By the time we arrived at the car park that the GPS selected which as it turned out was a hotel one and I couldn't use I was at the end of my rope. Thankfully a bit of fresh air and James taking over Hannah duty I started to feel better. 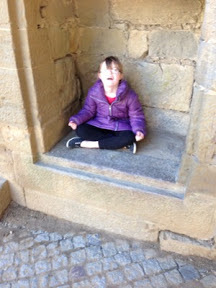 I think I was the one that needed to sit and meditate! All is forgiven after coffee and hot chips! Oh dear pleased it all ended out all right in the end hope the coffee was for you and not Hannah! 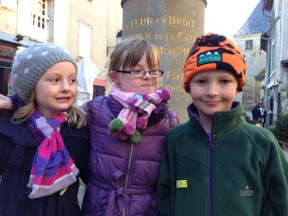 Sounds like you had a great visit with Anna, Malcolm and boys - nice you got to show off your local knowledge!